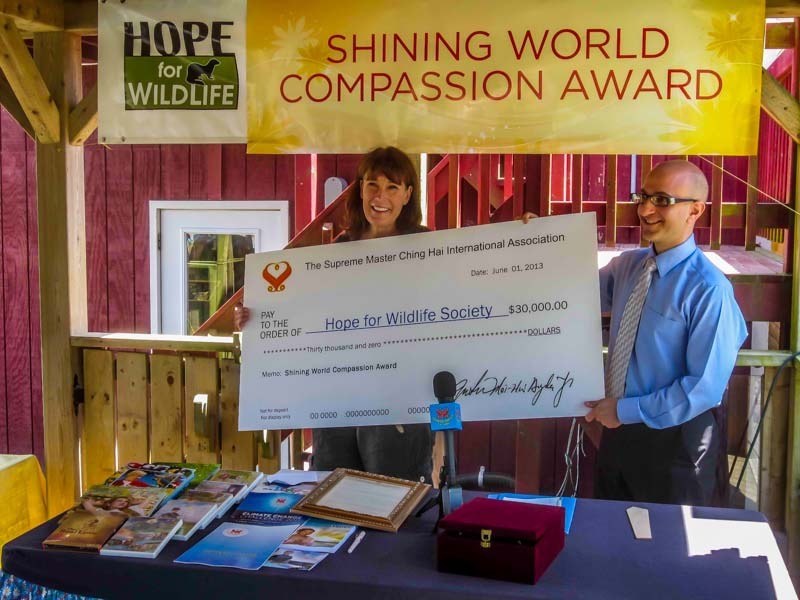 Ms. Hope Swinimer, Founder and Director of the Hope for Wildlife Society, was presented with the Shining World Compassion Award and a check for US$30,000 in a warm and intimate ceremony attended by local media, friends and volunteers on June 1, Golden Year 10 (2013). 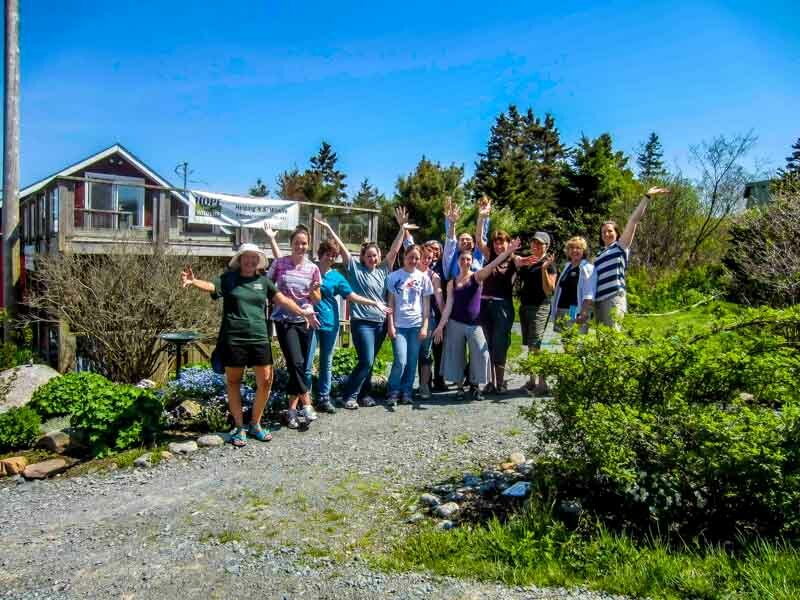 The presentation took place at the Society’s rehabilitation headquarters located 40 minutes north of Halifax, Nova Scotia, Canada, in the town of Seaforth, which is in close proximity to the Atlantic Ocean. 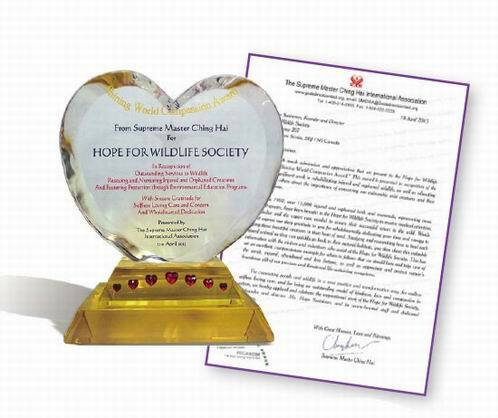 The Award, given by spiritual teacher and humanitarian Supreme Master Ching Hai, paid tribute to the Canadian organization’s extensive services to wildlife including the rescue and rehabilitation of injured and orphaned birds and mammals, a wildlife help line, as well as public environmental education programs. Over 15,000 injured and orphaned wild animals representing more than 250 species have been helped by the Society since 1997. Animals admitted to the shelter receive medical attention, food, housing and the expert care needed to ensure their successful return to the wild. The wildlife haven is operated purely by volunteers who take no financial remuneration for the time and service they render. The Award ceremony was attended by local Halifax Regional Municipality Councillor, Mr. David Hendsbee, and longtime Society volunteer Ms. Allison Dubé, who spoke of the enduring spirit of the Society and its founder. Also in attendance were friends and volunteers of the Society together with members of The Supreme Master Ching Hai International Association, who had traveled by car from Montreal for the occasion. Later, Ms. Swinimer wrote the following thoughtful letter to Master. 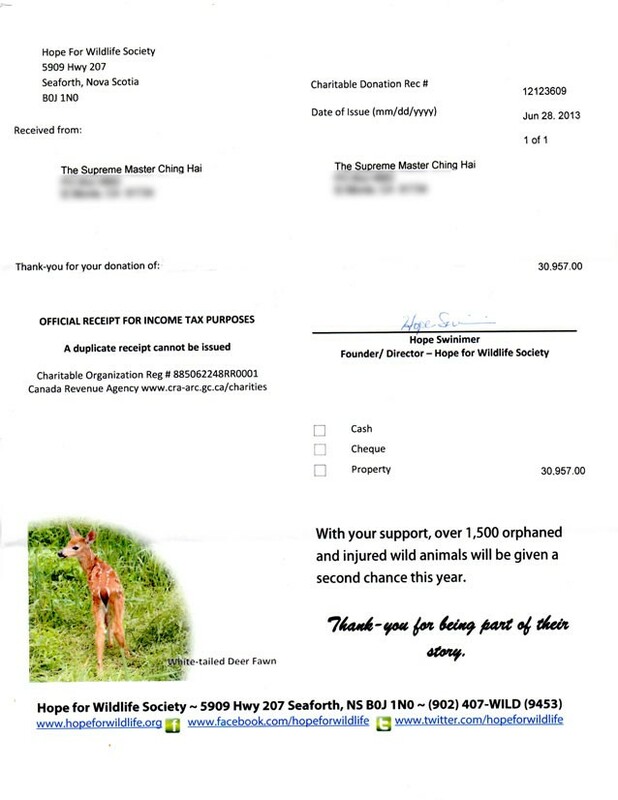 I would like to take this opportunity to once again thank you for your very generous gift to the Hope for Wildlife Society. 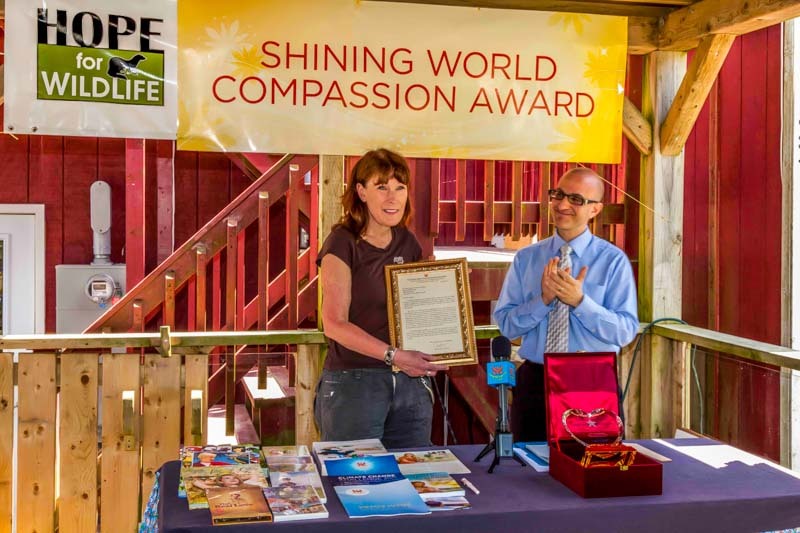 I am truly honoured to have received a Shining World Compassion Award; at Hope for Wildlife we see compassion on a daily basis but it means so very much to me and the volunteers that our compassion is recognized by others. I know that Hope for Wildlife is just one of many deserving charities and we are so very fortunate to be the recipients of this award and accompanying donation. You can be certain that this generous gift will go a long way in helping us provide the very best care to injured and orphaned wildlife in Nova Scotia. As our services are in ever-growing demand across the province, we continue to put a strong emphasis [on] education and prevention. On behalf of myself, the volunteers, and patients – past, present and future – we say Thank-You. After the presentation, attendees were treated to delicious vegan sandwiches accompanied by quinoa and brown rice salads. Also enjoying the festivities were reporters from The Snap, a local newspaper, and Global TV, who aired a report on the event on the local news at 6pm and 11pm that evening. Members of The Supreme Master Ching Hai International Association reported that it was truly a pleasure and a blessing to meet such beautiful, selfless and kind people. They were grateful for the opportunity to be involved in the event and commented that everything, including the weather, was perfectly arranged for the occasion! 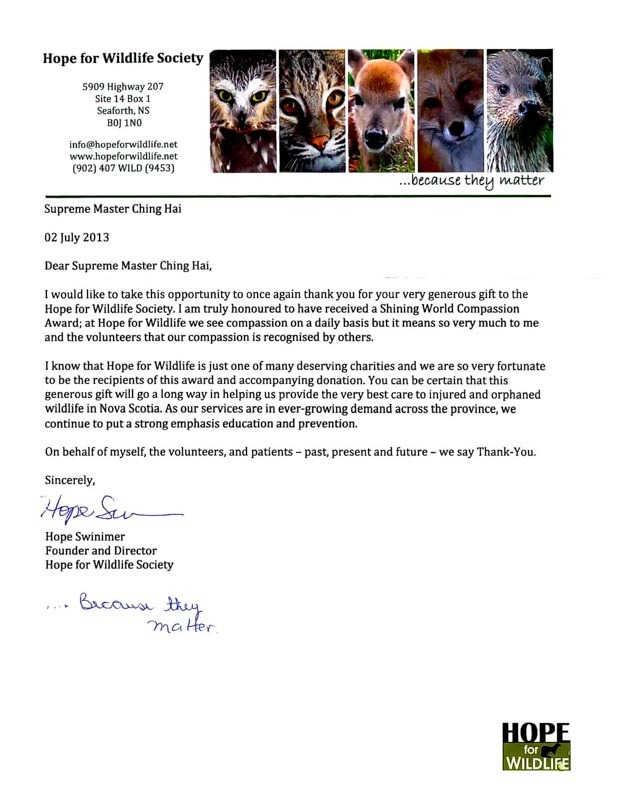 Our sincere gratitude, Ms. Hope Swinimer and the many other devoted individuals at Hope for Wildlife Society, for your commitment to our dear animal friends. May Heaven bless you, and the many beings you help, with much happiness.